NEMS celebrated its second year at an Annual Meeting on November 5, 2017 in Framingham, MA. 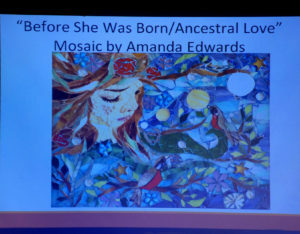 Fortyeight members gathered for a program that included a critique of mosaic art made by nine members. 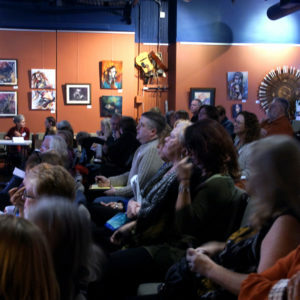 Cynthia Fisher, and Cathleen Newsham were the critique team that provided feedback on what worked in each piece and made suggestions for improvement. We also introduced the co-chairs of all committees as well as our new webmaster, Cassie Doyon. Amy Marks discussed the results of the annual member survey and suggested that the new officers address two issues: making the exhibition process more inclusive so all members can participate and create programs in regions outside the Boston metro area. 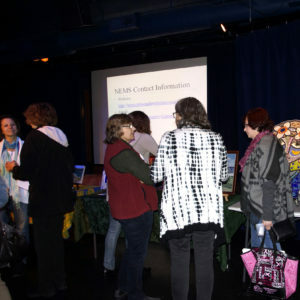 In addition, members wanted more programs that would help them improve their mosaic skills and techniques. We updated everyone on the SAMA Conference and introduced our first community services project at Ronald McDonald in Portland, ME. In addition, we introduced the concept of an All member exhibition at the Somerville Museum this winter. We ended with a talk on photographing mosaics with your mobile phone by Carrie Fradkin. 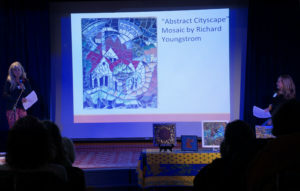 We ended with snacks, networking and viewing members’ mosaics in the Salon. A great end to a great year!